Engineer: Brad McMannen Stroud Engineering P.A. Building Model: Scale: 1"=10' Size: 42"x36"
Site Model: Scale: 1"=30' Size: 27"x48"
Site: Machine cut, hand finished, natural (no exposed contours) with painted roads, walks, water features including landscaping and lot lines.. Buildings - Club House and Condominiums: Full detailed buildings with windows, facade and roof fenestration. Building to include full texture and color representation. All Architectural Design setbacks indicated including window and door setbacks of the Architectural Design. 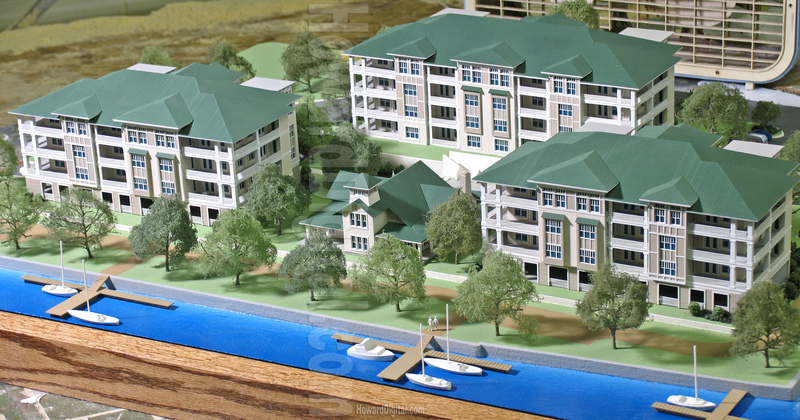 The demolition of the old Spooners Creek Marina and Apartments was completed in December of 2005. We will continue to bring you updated photos of the new community as construction continues. Copies of all photos will be saved. Should you be interested in copies please contact Terry at the Waterfront Lifestyle Properties office or at cell number 252 241-0770. Our Waterfront Lifestyle Properties office is located at 5113 B Hwy 70 (1/4 mile east of the Belk plaza) in Morehead City. Lanette can still be reached at our old marina number (252) 726-2060. Things have changed quite a bit, but we are still looking forward to seeing you at the new Shores At Spooners Creek Marina. Hope to see you there soon.